Fractora Skin Rejuvenation is a revolutionary skin treatment that uses radiofrequency in a fractional way to reduce wrinkles, improve skin complexion, and tighten skin. 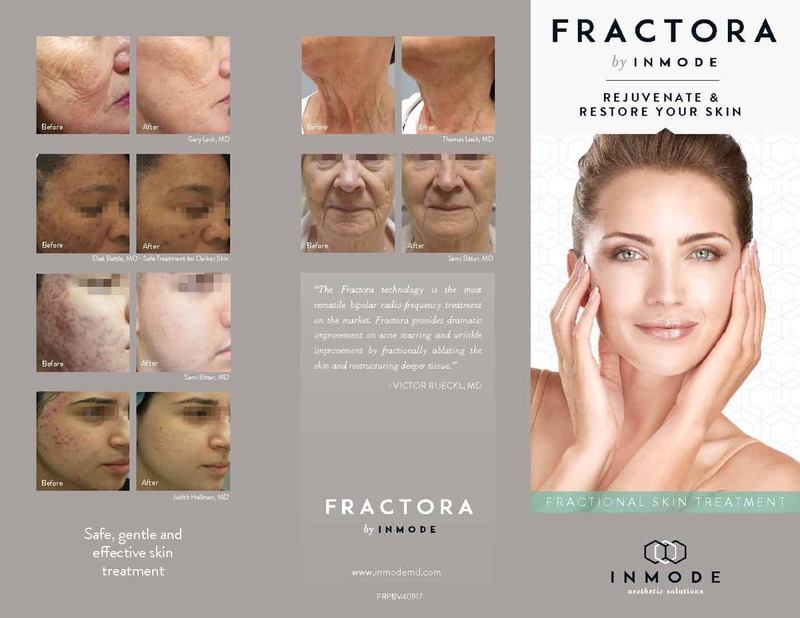 Fractora is effective for fine lines, deep wrinkles, scars, redness, and uneven brown pigmentation. What Areas Can Be Treated With Fractora? Fractora delivers radiofrequency energy to the skin through an array of microscopic pins producing localized heat through small micro- dots. The gentle heat generated by the Fractora pins in the tissue directly underneath the skin promotes collagen growth and tightening. Why Choose Fractora Skin Rejuvenation? Other treatments for these conditions can require multiple treatments and cannot achieve the same amount of tightening and smoothing as Fractora. Fractora™ Skin Rejuvenation requires little downtime. Most patients are red for 1-3 days with some peeling. During this time patients apply healing ointment followed by a bland moisturizer. Patients can use light mineral makeup 48 hours after the treatment. Is The Fractora Procedure Painful? The majority of patients who undergo Fractora treatments do not find the procedure painful. When you arrive at our office, we will apply a specially prepared numbing medicine to your skin that will minimize any discomfort you may have. For patients who are more sensitive, we can speak with you about other alternatives. How Soon Will I See Results From Fractora? Some patients notice visible results immediately after the treatment, but typically after 2 weeks some smoothing and tightening start to appear. Improvements continue up to 3 months after the treatment. 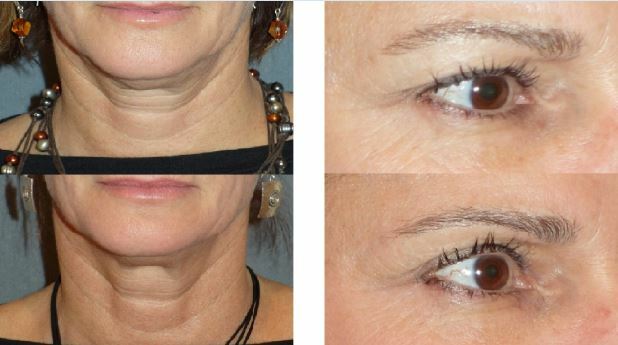 The pictures below are taken of one of Dr. Ahn’s patients after 2 Fractora treatments. The first picture was taken after 2 Fractora treatments to the neck. The second picture was taken after 2 Fractora treatments to the upper and lower eyelids. What Is The Cost of Fractora? The cost of Fractora usually ranges between $1500-$3500 per treatment, depending on how many areas you are having treated. Please speak with one of our patient advisors for more information. The first step in discovering if the Fractora™ treatment is right for you, is to schedule a complimentary consultation with Dr. Ahn. During your appointment, Dr. Ahn will evaluate your skin and discuss the best treatment options for you. *Individual results will vary. Please schedule a consultation with Dr. Ahn and the staff at The Aesthetic Wellness Center to understand your treatment options.